Contrary to the chummy chunkiness of the driver orwoods and the slim, elegant finisher that is theputter, the irons are always the coolest clubs in agolfer's bag. Perhaps it is the surgical precision oftheir build and the fact that they are similar totheir near neighbour but at the same time slightlydifferent in terms of performance and function.Certainly the rookie can be forgiven for mistakingone for another, but taking the time to familiariseyourself with the strength and relative weaknesses ofeach can pay big dividends as the learning curve onthe course steepens. A good starting point for understanding thedifferences between irons is to take them out andexamine them. From the two to the nine iron, inascending order, the individual club length decreasesby half an inch and the degree of loft, i.e. 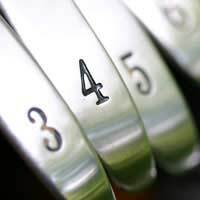 the angleof the club face, increases by four. So, for example,the length of a two-iron shaft is 38.5 inches and theloft 18 degrees, whereas its nearest companion, thethree iron, is 38 inches with a loft of 22 degrees.This holds true consistently up the scale to the nineiron (35 inches in length with a loft of 46 degrees). Confused? Well, you wouldn't be the first rookie tothink, "I'll never get the hang of this." The goodnews is that you will; it's all just a matter ofexperience. And it is precisely with experience that aplayer comes to understand why a particular shotrequires, say, a four iron, not a five. Starting withthe basics, the further you want to hit the ball, thelower the iron you should choose. So if you arelooking to hit around 200 yards, then it's the twoiron that should be in the palm of your hand. Thisclub possesses the least angle of loft among the ironfamily, so while you can expect to hit your balllonger than with any other club of this type, you canalso expect that it will fly at a low trajectory. In terms of distance, the iron family turns from long-to mid-range ability around the five, with theaccompanying increase in terms of trajectory provingideal for skipping over those fairway bunkers with adegree of ease. For delicate approach shots fromaround the green, it is the eight or nine iron thatyou should be choosing, although the closer the ballis, you may decide that a pitching wedge may be moresuited to getting the ball as close to the pin aspossible. Contact between club face and ball will be impairedA final important point about irons concernshousekeeping. The ridges on the face of each club arethere to ensure optimum performance so be sure tocarry a towel to wipe away any dirt or turf thatbecomes caught in the ridges, otherwise contactbetween club face and ball will be impaired and yourshot will suffer accordingly.So dealing with irons is very much a case of trial anderror. But instead of becoming frustrated when poorclub choice sees your ball sailing over the back ofthe green or pulling up well short, or in the sand,remember that next time you'll know better. After all,practice does make perfect.